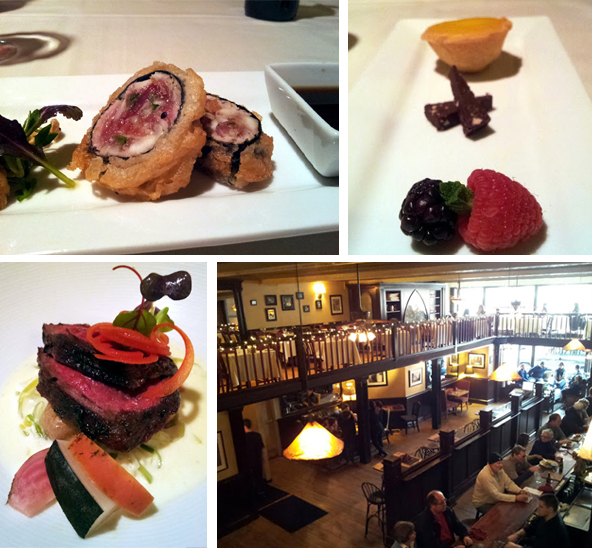 You may remember that last month I went on a preview of this week’s Frederick Restaurant Week. My group of journalists and bloggers went to and sampled the menus of three participating restaurants. By the end of the day, there was one clear winner. Let’s back up. Frederick Restaurant Week runs from today (March 3) to Sunday, March 9. The 18 participating restaurants offer a 2 course lunch for $15.14 or a 3 course dinner for $30.14. Why Firestone’s? Out of all of the menus we tasted, Firestone’s was by far the most thoughtful. It was unique and varied. We tasted sushi grade tuna tempura roll, grilled hanger steak with pickled root vegetables and creamed leek and, for dessert, a lemon tart served with a side of chocolate almond crisps. After the tasting, all six of us were gushing. The chef (Dave Rusk) came out and amid our chorus of praises he seemed to recede into himself, politely (but concisely) answering our questions. Humble or introverted. Either way he makes amazing food. It helps that the restaurant is housed in a 100 year old building that began as a sporting goods store, then a pub, and has been Firestone’s since 1999. My favorite part is the mezzanine. And the two-story windows peering down on Market Street. Forgive the poor photo quality. I only had my phone with me. Some restaurants will feature a separate restaurant week menu, but Firestone’s has decided to keep its entire menu for the week. You can order anything off the menu and it will be within the restaurant week prices (there are several items that have a supplemental fee). You can see the menus here. So, where will you be dining in Frederick this week? Should I make more reservations?